Beautiful surroundings are something Arizonans almost take for granted. From our astounding geology to its tenacious ecology, our Sonoran Desert shows us breathtaking beauty and natural wonder. Have you ever wondered what shaped this land? Behind the rock formations, climate patterns, flora and fauna there lies an ancient history that the region is still connected to. Based in part on our latitude, the Sonoran Desert is a diverse ecosystem that reflects its designation as the most “tropical” desert on the continent. This means that the Sonoran Desert, while being a desert, is simultaneously governed by tropical forces. Few places in the Sonoran Desert experience winter frost. The summer rainy season is a tropical remnant as well, with the storms coming our way directly from tropical climates. Believe it or not, Arizona was a much less desert-y place 65 million years ago. In the era known as the Paleocene, our area of present-day Phoenix was part of a sprawling forest that took up most of the continent. Varieties of ferns and evergreens came up in a fairly warm, fairly wet environment. Of course, there’s a catch. This majestic early forest was home to a wide variety of dinosaurs as they ruled the land for many millions of years. The dinosaurs went extinct around 57.8 million years ago and their retreat signaled the rise of the next era: the Eocene. Around this far back, plants started to evolve to reflect and survive the change of the seasons. 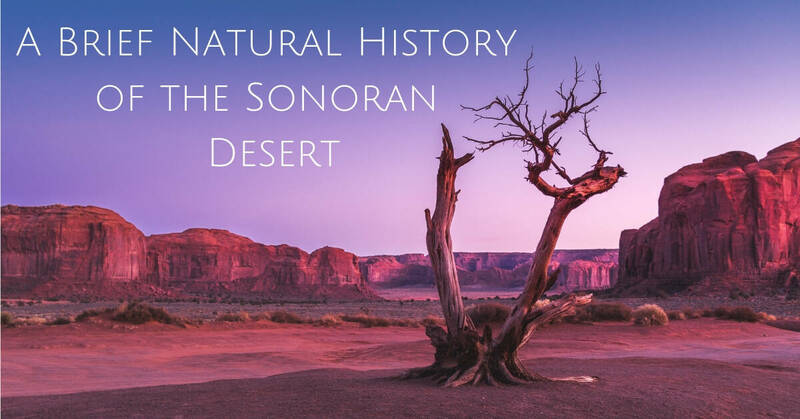 In the Sonoran Desert, this meant that deciduous trees began appearing, probably in response to dry seasons, cutting into turf that was once primarily for evergreen trees and shrubs. The Eocene also marks the beginning of succulent plants and cacti which began to evolve in our area. Although the fall of the dinosaurs wiped them from the Earth, all life didn’t go extinct. Around this time and up until about 33.6 million years ago new animal life began to populate the planet. Fossils of ancient lizards and alligators have been found as north as Canada, indicating a warm, forested continent. The close of the Eocene marked the start of the Oligocene, which lasted from 36.6 million years ago to 23.7 million years in the past. Although it is hard to trace in the fossil record, this era seems to be the period when grasses evolved and proliferated. The evolution of lizards and snakes also moved forward, as well as the ancient relatives of the modern desert tortoise. The end of the Oligocene was punctuated by huge volcanic activity that reshaped the land. Seismic and volcanic activity cleaved huge mountain ranges into the land. With the new land formations, dramatic shifts in the climate of the area began to occur. Tropical rain from the ocean was blocked from reaching inland and the center of the continent began to dry out. During this time, the Miocene era begins and many things shift in the region. Principal among them, with an increasing aridity an environment known as “thornscrub” occupied the region as tropical forest retreated for lack of water. Plants evolved to overcome the dry climate populated the thornscrub which is now the Sonoran Desert. Many of the signature plants of the Sonoran Desert region including saguaros, ocotillos and boojum trees began to occupy the landscape. Palo verde trees as well as ironwoods also were part of the new biome. The changes of the Miocene era pushed into the Pliocene era, dramatic shifts in land formation and geology continued to develop. The Pliocene lasted until about 1.8 million years ago, when a dramatic new climate pattern emerged and ushered in the Pleistocene, an era of long ice ages punctuated with brief interglacial periods. In the Pleistocene, the flora and fauna of the Sonoran Desert was continually moving through cycles of retreating and expanding its territory. The environment that we know today as the Sonoran Desert was only constituted 9,000 years ago with the retreat of the last ice age, although many of the species that call the Sonoran home had been evolving in the region during interglacial times, only to retreat to warmer areas during ice ages. Today’s desert is a dramatic mix of ancient and more modern fauna and an adaptable mix of plants, shrubs, cacti and trees. Life in the Sonoran Desert in our present day is good! If your home needs an extra layer of protection from the desert sun (and heat), contact us at CC Sunscreens! Sunscreens protect your home from the sun and keep temperatures cool and comfortable without astronomical energy bills. Live in the desert the smart way – give CC Sunscreens a call.